Nobody has shared their opinion about Wally yet. Be the first. Recommendations: The 4 people who like Wally also like the following games. Well... it was fun, funny, stuped, addicting, annoying, short, long, impressive, sickining... and many other things I just can't put into words. Simply Amazing. A wonderful game. If you want to download something download this. What a strange game, almost childish. It was not very hard and not very 'exciting' so to speak... but I still couldn't tear myself away until I beat it. I agree with Feet First.This game has absolutely no challenge to it.The music was alright.Just it's very easy to win without dieing.But that smiley face sun in the background was very distracting because whenever I passed it I couldn't concentrate.But I beat and that's what matters (that is what I always say).But nothing stopped me from beating it unless it was up to me to unlock the bonus level.Overall good game you deserve a 10. This game is way to short and easy to complete. It has no challenge to it. If i were concentrating I could have finished this without dieing the first time I played. The sfx was good with the lemmings sound. The music was fine. I didn't mind the graphics. Not really an interesting game. Wow, what a lovely platformer full of a lot of originality. The thing that makes it difficult is the friction, a lot more friction than most games. But the friction also makes it very fun. The last level with the sliding platforms is even harder with the friction, because you can't stay on the platforms as they go back and forth. This game is full of lots of little distractions/obstacles such as Red Balloons that you pop, floating green balloons, keys and locks, Wally Head 1 Ups, springs, and sliding platforms. Plus you get a bonus level if you popped all the red balloons. Another great thing about this game, is the humor this game has. At the beginning of each level have a witty subtitle such as. 'Don't forget to pop those nasty balloons! They were talking about your mom yesterday... said she was fat! You gonna take that?'. 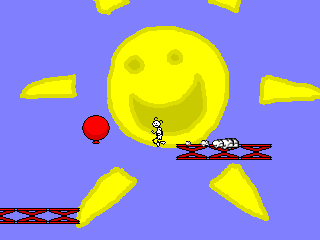 Plus the graphical style is some what humorous such as the giant sun smiley face in the background. Very fun to play, and lots of obstacles to make it difficult, especially that friction. Fits the expressed theme very well, for what its going for, great. Very original. Haven't seen many platformers like this. Due to the shortage of levels, there isn't much you can do after you beat it. Though you could aim for the bonus level.